Lectins are proteins found in plants, animals and microorganisms, which can recognise and selectively bind with a remarkably diverse range of carbohydrates on cell surfaces. In the plant world, lectins play an important role in a number of biological processes. They inhibit the functioning of invading microbial cells, defend against parasites and insect predators, and they promote the healing of accidental wounds and the cellular growth of the plants themselves. Plant lectins are considered to have a wide range of applications for the diagnosis, symptom management and treatment of diseases in humans, particularly due to their demonstrated antimicrobial, antitumor and healing activities. SynDermix is developing drug candidates based on two plant lectins with the potential to treat multiple diseases that affect the epithelial tissues of the human body. With the use of ground-breaking genetic engineering technology, our lectin compounds are optimised for the safe use in humans and are developed in an environmentally sustainable way. The lead compound of SynDermix, SDX-13, is a recombinant Phaseolus vulgaris lectin currently in development to target mucosal disorders. The most advanced drug candidate in our lectin pipeline is intended to treat oral mucositis, a major unmet medical need and a debilitating condition that affects cancer patients undergoing chemotherapy and radiotherapy treatment. Formulated as a swallowable mouthwash, SDX-13 has been demonstrated to be safe and effective in shortening the duration of oral mucositis in adult patients undergoing chemotherapy. 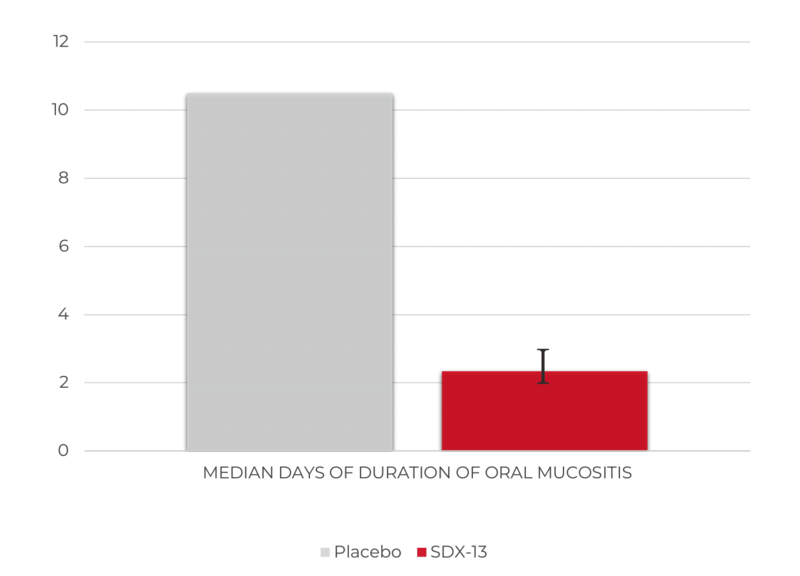 In a Phase IIa randomised, double-blind and placebo-controlled trial involving 52 patients, patients in the active treatment groups experienced oral mucositis for a median of 2 to 3 days, compared to 10.5 days in the placebo group. Today, SynDermix is working towards developing a sophisticated proprietary mouthwash formulation in preparation for a Phase II/III oral mucositis trial that is expected to begin in early 2019. 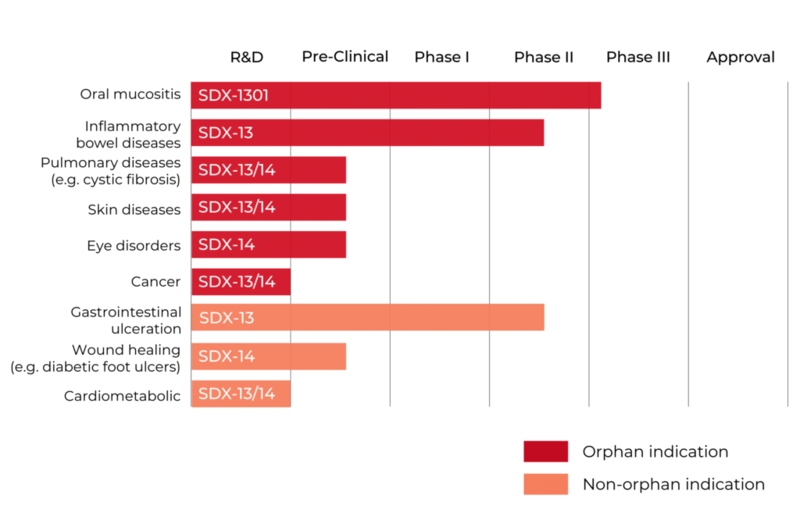 In its next steps, SynDermix intends to develop further proprietary drug delivery systems and to enter its lectin drug candidates into clinical trials for the treatment of gastrointestinal, respiratory and skin diseases. Also in progress are target-agnostic cellular prediction models, which are generating proprietary pre-clinical data for the future pipelines of SDX-13 and our second recombinant plant lectin, SDX-14. ¹ Bar chart adapted from data presented in Table 3, in Hunter A., Mahendra, P., Wilson, K., Fields, P., Cook G.. Peniket A., Crawley, C., Hickling, R. and Marcus, R. Treatment of oral mucositis after peripheral blood SCT with ATL-104 mouthwash: Results from a randomized, double-blind, placebo-controlled trial. Bone Marrow Transplantation 43, 567 (2008).